An aerial photo shows the edge of the Holuhraun lava flow (blue line), where the lava went over a combination of sand and bedrock. Two types of lava appear on either side of the red line: smooth pahoehoe on the right and rubbly a’a on the left. As volcanologists at Lamont-Doherty Earth Observatory, we love everything lava. Right now, we’re exploring how the structure of the surfaces lava flows over influences how it advances. Does it matter if the lava is flowing on loose sand or solid rocks? On a road or a grassy field or into a forest? 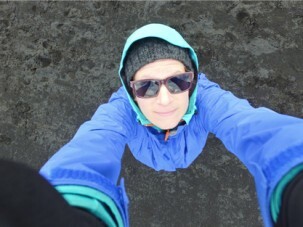 We headed to the “Volcanologists’ Disneyland” — also known as Iceland — to find out. Our destination was one of the largest lava flows ever recorded in human history, the recent flow at Holuhraun. Because the flow is so large, it covers areas with varying ground characteristics: old flows, solid bedrock, subglacial sand, a pebble-covered river bank, a large river, and so on, making it a good site for studying lava-substrate interaction. 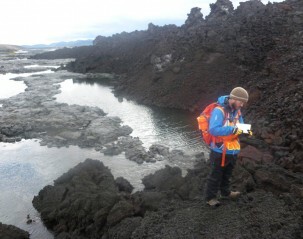 Andy Ryan takes notes on how the new lava flow (dark brown/black) interacts with the old flow (gray) and the river. We joined a large group of other scientists (17 total, about half of them graduate students) collaborating on the study of the volcanic terrain, led by Professor Christopher Hamilton of the University of Arizona. These were mostly planetary scientists from NASA, the USGS, University of Arizona, Arizona State, University of South Florida and University of Western Ontario, all interested in looking at the Holuhraun flow because of its close resemblance to lava flows on other planets, particularly Mars. The group brought different instruments to document various aspects of the flow: A LiDAR scanner was used to scan the topography of the main vent at very high resolution (millimeters). High-accuracy mobile GPS antennas were walked along the flow margins and across the flow interior to map them in <10 cm scale. A thermal camera recorded temperatures at cracks and hot springs. And the eyes, cameras and notebooks of all members recorded geomorphological observations of the flow’s characteristics such as roughness, vesicularity and flow type (e.g., a’a/pahoehoe). 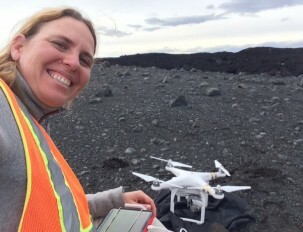 Einat Lev with Buzz, the unmanned aerial vehicle used to map the lava flow. Our main tool was an unmanned aerial vehicle (UAV), also known as a drone, that carries a camera. We call it Buzz. Every day in the field, Buzz took thousands of photos of the lava flows, looking particularly at the edges of the flow. We will use the photos to construct a three-dimensional digital topography map of the flow. Photos of the areas outside the flows will help us classify the substrate that the lava was flowing over. Elise Rumpf prepares to catch Buzz as it descends. The ground was too rough to land the UAV. The Holuhraun flow is located in a remote part of the Icelandic Highlands — between the volcanoes Askja and Bardarbunga, just north of the Vatnajokull ice cap. The latest eruption started in April 2014 and lasted until February 2015. Visiting the flow so quickly after the eruption ended required special research permits — the fresh lava is highly unstable and easily collapses when stepped on. The internal parts of the flow are still very hot, as evidenced by the constant fuming of water vapor from cracks in the flow’s crust. The Holuhraun flow is unique in that the river that occupied the valley in which the flow traveled is still flowing underneath the lava. The water is heated by the lava and emerges at the front of the flow at temperatures exceeding 120 degrees Fahrenheit (50 degrees Celsius). While some parts of the river make for incredible bathing spots, others are dangerous to cross. 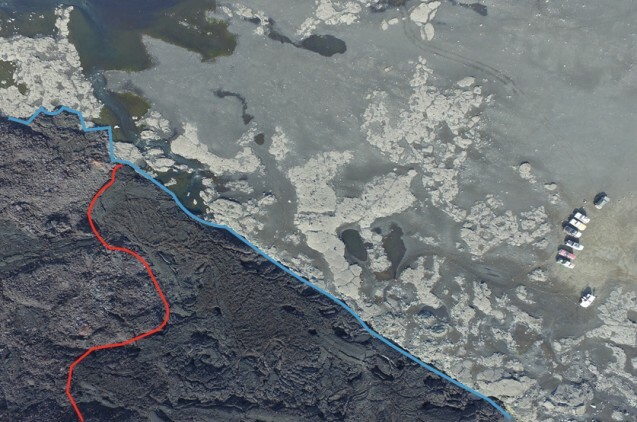 We noticed that the Holuhraun flow was confined by the river banks on one side but not on the other, and that the lava bulldozed into the unconsolidated sandy river bed. This sort of bulldozing and resistance to flow is never accounted for in lava flow models and may be important where lava is flowing over layers of sand or ash from a previous eruption. Even in August, the team dealt with strong winds, pouring rain and chilly temperatures (30s to lower 50s Fahrenheit). On occasion, the daily forecast called for rain, sun, gusty winds and fog all at the same time. The changing weather conditions made it difficult to plan for flights, yet we still managed to pilot dozens of successful flights, and covered most of the flow front and margins. The team plans to return to Iceland next year to look at changes in the flow and the areas around it. The map we create with this year’s data will serve as a baseline to measure the changes. The group bathes in part of the river with pleasant temperatures, while a sign warns of the hot water at the next stream. Learn more about Einat Lev’s research and other work underway at Lamont-Doherty Earth Observatory.